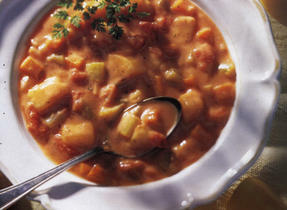 Vibrant in colour and flavour and packed with nutrients, this soup is simple to make and a pleasure to eat. Serve with a whole grain sandwich for a nice, light meal. Cut broccoli stalks from tops; peel fibrous outer layer from stalks and chop coarsely. Cut tops into small florets; set florets aside separately. In a pot, combine chopped stalks, garlic, onion, rice, hot pepper flakes and stock; bring to a boil over high heat. Reduce heat, cover and boil gently for 10 min or until rice is almost tender. Add florets and cook, covered, for about 10 min or just until broccoli is cooked. In a blender, in batches, or with an immersion blender, purée until smooth; return to pot, if necessary. 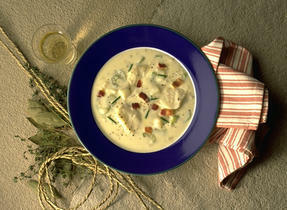 Stir in milk; heat over medium-low heat, stirring often, just until steaming (do not boil). Stir in lemon juice and season to taste with salt and pepper. Cooking Tip: Save preparation time by buying pre-cut broccoli. You'll need 1 1/4 lb (560 g) or 6 cups (1.5 L) in total. 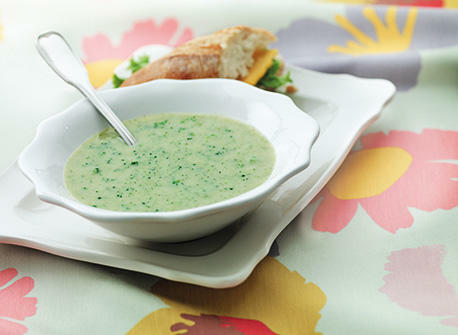 For the Adventurous: Add 2 cups (500 mL) chopped Swiss chard or spinach with broccoli florets. Sprinkle each serving with 1 tbsp (15 mL) shredded extra-old Cheddar or aged Gouda cheese. Healthy Eating Tip: November is Osteoporosis month; celebrate by treating your bones to a bowl of this delicious nutritious soup. You can boost the calcium and vitamin D content by sprinkling with grated Parmesan or shredded Cheddar cheese and pairing with a tall cold glass of milk.